Long before there was an anvilfire, I wrote the story of my first anvil. Since then I have answered two questions on anvilfire as stories about 18th century American Colonial era blacksmiths. Now we are happy to present the story The Revolutionary Blacksmith by Jim "Paw-Paw" Wilson. Many of you know Jim as the rough old army drill Sergeant and a good ol' West Virginia country boy. Now you will get to know him as author and more than a bit of a romantic. The Revolutionary Blacksmith is being published in print by Ruby Faire as a serial. One chapter a month. Anvilfire is co-publishing this wonderful story on-line with a one month delay. Whence comes the luck of the horseshoe? As told by Jim "Paw-Paw" Wilson. 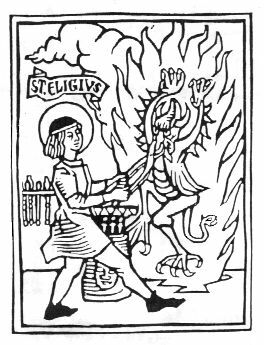 His version of the St. Eligius / St. Dunstan myths. As told by Jim "Paw-Paw" Wilson. By Jim "Paw-Paw" Wilson. Historical Fiction novella in progress. Look for a new chapter every month. Illustrated by Jock Dempsey, anvilfire guru. James Nasmyth : Autobiography NEW! Autobiography of one the all time great inventors. Nasmyth invented the steam hammer, lathe reversing mechanism, shaper, safety ladle and more! Historical fiction by Tim Cisneros about the Henry Haus Blacksmith Shop, Pope, California, USA. By Jock Dempsey. Historical Fiction. The inspiration for the novel by Jim Wilson. By Jock Dempsey. A true story. Adopted from the rules of Bruce "Atli" Blackistone, Oakley Forge. An old story defining the King of Crafts. From the collection of Jim Paw-Paw Wilson. Humor? Annonymous on request. .
Southern folklore about honor and humor. Do you tell a good blacksmith story? Have a version of one of the blacksmith myths? Send it to us and we will publish it here.